Home > Tips > My Cat Ate Gum: What Should I Do ? My Cat Ate Gum: What Should I Do ? Our little beasts will always surprise us! It seems that once in a while, they like to cause us some worries, too. You come back home from a long day at work and notice like a smell of guilt in the air. You soon discover the evidence of a crime that has been committed very recently. As funny or silly as it may sound, your cat may have put himself in a dangerous situation. Before we start explaining more in depth : if your cat ate gum that contains XYLITOL, go straight to your vet, do not waste time. Seriously, go now! My cat ate gum : What are the risks ? There are three main risks associated with this situation of “gum swallowing”. Two are pretty obvious but the last one might be surprising to you. Choking is pretty obvious, if your cat is trying to eat a piece of gum it’s just the same as you swallowing it accidentally. If it stays stuck in his/your throat it will have the same effect. Maybe even worse since he is a whole lot tinier than you. A piece of gum is then a bigger object in comparison to your respective sizes. Anyway, if you have time to prevent him from swallowing it, then you MUST and all 3 risks will be avoided. The first major risk is related to intestinal obstruction: gum is simply not digestible by cats (or humans for that matter). That’s why we do not eat chewing gum but we simply spit it out. Your cat is obviously not aware of this important fact (or is he? ^^). If you notice any of those signs, it could potentially be harmful to your cat. He probably will require surgery by your veterinary. Yes, you read that well ! Why ? This comes from a gum compound with a barbaric name: XYLITOL. Fortunately, this ingredient is not used in all types of gums. 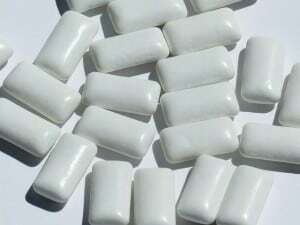 Mostly in sugar-free gum (or other products like sugar-free mints, tooth paste, chewable vitamins, oral-care products). It is essential that you check the presence of this ingredient if you still have the gum’s wrapping. Not only does it have a barbaric name but also a barbaric effect on your cat. Xylitol is an artificial sweetener that is perfectly fine for us humans but has a nasty action on your cat’s pancreas. 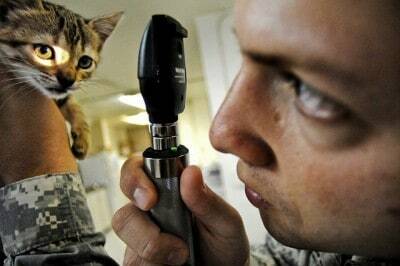 It stimulates the release of insulin that consequently reduces the level of sugar in your cat’s blood. As a result, it only takes 30 to 60 minutes for your cat to suffer from hypoglycemia (with level of xylitol as low as 0.1g xylitol /kg body weight). Let’s not forget another aspect of Xylitol ! It could also damage your cat’s liver. At higher levels (around 0.5g xylitol /kg body weight) xylitol could really hurt your cat. My cat ate gum, what to do ? GO SEE YOUR VETERINARIAN AS SOON AS POSSIBLE. HE IS THE ONLY ONE ABLE TO TELL YOU WHAT TO DO NEXT. It is scary to catch your cat eating gum, even more if it contains this Xylitol ingredient. If not treated fast enough it could be fatal to your cat. That is why you need to act fast. Bring him immediately to your vet ! If you do so, you will without a doubt get your little companion out of trouble. Your vet will need to get the Xylitol out of your cat’s system in order to get him back on his feet. He will probably need to monitor his glucose level for some time to make sure it remains stable. It will all depend on how much gum your cat ate and how fast you brought him to his doctor. Prognosis is good if you react fast but gets pretty ugly if it comes down to liver failure : make sure to be proactive here. 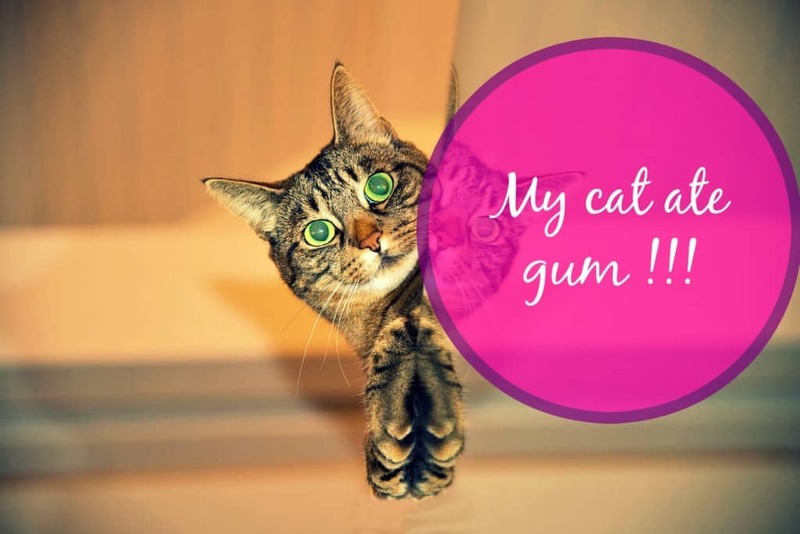 Out of all human foods that are dangerous for your cats, gum is probably in the top 10! Cats are a little bit like kids, except tinier and sneakier so make sure you keep your gum in a safe place out of reach from your furry companion. If you want to know more about human foods that cats can eat, make sure to check out our infographic and complete article here ! It’s not always easy to make the distinction between what is good from what is not. 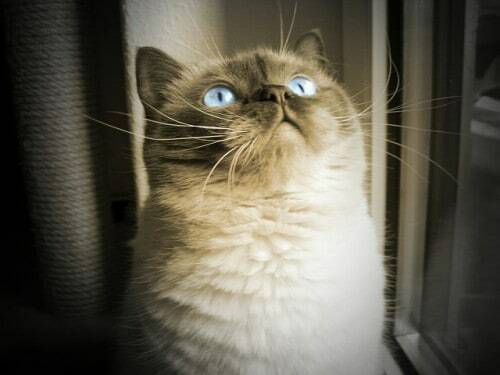 Just know that cats and humans are very different, our systems do not process food the same way. It’s a good reason to always be extremely careful when feeding our cats with leftovers or ingredients we think are treats. Next Post Why Is My Cat so Vicious ? My cat licked a piece of gum not containing Xylitol he seems fine several hours later. Is he ok? My 5 month old kitten just ate a half peice of gum it was mint flavored he was being crazy now he’s completely calm should I be worried I can’t get to the vet until tomorrow is he ok until then? 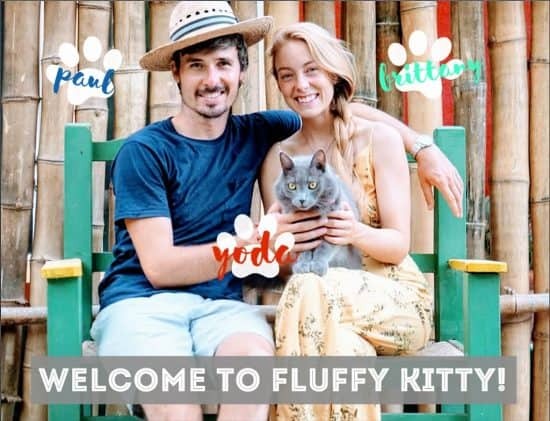 Hi Kaylee, just monitor your kitten and if you notice any weird out-of-the-ordinary changes in behavior then it’s best to call your vet. Hi, I’m watching a cat and he ate some gum that did not contain Xylitol, we triple checked. He seems just fine now, should I be concerned? Hey Emily! When was this? It is probably just fine – like you said. Good thing you triple checked! If the kitty hasn’t shown any reaction signs then it should be okay. Just keep an eye out for the next 24 hours. I was out of town for Christmas. When I got home she told me there was gum on her collar (near the clasp.) I looked and there were what were the remains of old gum. She had problems with her kidneys for about 6 months (she was 18 yrs old). Last week she came into the living room unable to breathe and fell over. I scooped her up and took her to the vet. He told me she was dying, I had some options to keep her overnight but was told she would probably die by morning. Do you think my lack of wrapping the gum before I threw it away killed her? So sorry to hear about your senior cat.. 🙁 Did you share this story with your vet? What did s/he respond? Your kitty was already quite old at 18 years and with already having kidney problems beforehand it’s possible the chewing gum wasn’t the cause but perhaps simply a contributing factor to her passing.. Also, just because it was gum on the collar doesn’t necessarily mean she ingested it, but of course, it’s hard to tell. Wishing you the best and sending our thoughts. Thank you for sharing your story with us. Hi Lona, yes Xylitol is very dangerous for your cat. Call or go to a vet as soon as possible! As mentioned in our article, Xylitol can have serious effects on cat’s pancreas, liver, intestines, etc., and can be life threatening. We recommend to be proactive in this situation. Thanks for reaching out, and best of luck!